Have you ever thought how people like Rakesh Jhunjhunwala, Dolly Khanna makes big money from stock market? They can do so because they invest in multibagger stocks. Multibagger is stocks that can give multi-fold returns to the investor. These type of stocks can make you wealthy in short period of time. Incredible right! Read on – Wipro appreciated multiple times in past 38 years. If you have invested just 10K in this stock during initial public offer in 1980 you could have made Rs.270 Crores today! By now you must have understood that way to earn big money from stock market is – Identify and invest in multibagger. How to identify multibaggers? There are two ways to identify multibagger stocks. First is to do independent research and second is follow biggest stock market experts like Rakesh Jhunjhunwala, Dolly Khanna, Porinju Veliyath etc. In a first way, you need to identify and invest in stock by yourself by doing your own fundamental analysis. The chances are good that your stock will give you very good return. However, on the other hand, it may be possible that you may end up losing money due to bad selection. The second way is a reliable way where you are investing in stock backed by research of stock gurus. History shows that famous stock gurus have extraordinary ability to identify multi-bagger stocks for investment. Almost every stock identified by stock gurus have given exorbitant returns in the past. If you have decided to follow second way, and looking for the stock recommended by stock gurus, here are 10 Multibagger stocks of Stock Gurus such as Rakesh Jhunjhunwala, Dolly Khanna, and Porinju. The first stock is Prakash Industries. Prakash Industries is a favorite stock of Rakesh Jhunjhunwala. In last financial year (2017-18), this stock has given 124% CAGR return to the investor. The second stock from Rakesh Jhunjhunwala portfolio is Titan. Titan has given 103% CAGR return to the investor in last year. Other multibagger stocks are from Dolly Khanna’s Portfolio. It includes a name like NOCIL (127%), IFB (100%), Thirumalai Chemicals (117%), Butterfly Gandhimathi Appliances (157%), Rain Industries (255%) and PAAP Automotive (125%). Next stocks are V2 Retail (141%) and Emkey Global (116%). These stocks are from Porinju Veliyath’s Portfolio. A simple method to earn multibagger returns from the stock market is given below. Buying its stock at right time. Holding the stock until the potential of the company is more than fully captured in its price. Exiting stock at an appropriate time. At last, I would like to share one common thing that is found in all these stock gurus. Everyone has the ability to understand the business and capabilities to trust the management who is responsible for running that business. If you can develop both these abilities you can also become wealthy like Rakesh Jhunjhunwala or Porinju Veliyath. 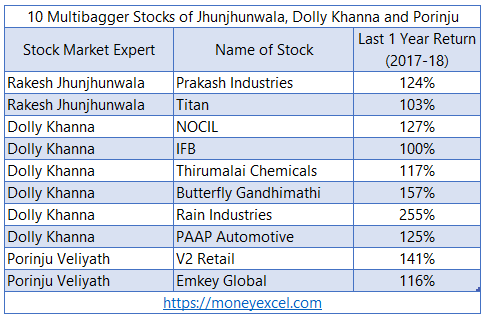 What is your take on these top 10 multi-bagger stocks of Jhunjhunwala, Dolly Khanna, and Porinju Veliyath? Do you own these stocks in your portfolio? Do you recommend investing in these multi-bagger stocks?